It is a fairly small, stocky kestrel with a large, flat-topped head and fairly short wings that don't reach past the tip of the tail when at rest. It is 28-33 cm long with a wingspan of 58-72 cm and a weight of up to 300 grams. The female is 4-11% larger and 5-11% heavier than the male. The plumage of the adult is uniformly dark grey apart from darker wingtips, faint dark streaking on the body and slightly barred flight feathers. The feet and cere (soft skin surrounding the nostrils) are yellow and there is bare yellow skin around the eye. 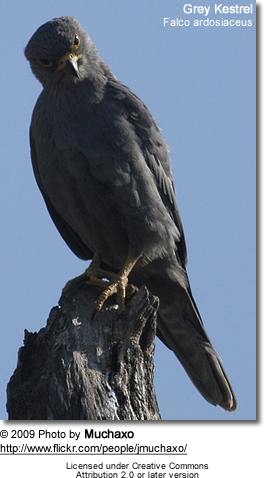 The most similar species is the Sooty Falcon which has a more rounded head, long wings extending past the tail and less yellow around the eye. It is widespread in West and Central Africa but is absent from densely forested regions including parts of the Congo Basin. Its range extends east to Ethiopia and western parts of Kenya and Tanzania. In the south it reaches northern parts of Namibia and Zambia and vagrants have appeared in Malawi. The total range covers about 12 million km². In West Africa there is some movement northward in the wet season and southward in the dry season. t feeds mainly on insects, lizards and small mammals such as bats but will also take birds, amphibians and worms. Prey is usually caught on the ground. It will sometimes feed on oil palm nuts, one of the few birds of prey to eat vegetable matter. Breeding occurs from March to June in the north of its range and from August to December in the south. Courting pairs perform mutual soaring displays. The eggs are usually laid in the nest of a Hamerkop; most often an unoccupied nest but occasionally Hamerkops will be forced out. Sometimes the kestrels will use the nest of another bird or a hole in a tree. There are two to five eggs in a clutch. They are whitish with reddish or brown markings and are incubated for 26-31 days. The young birds fledge after about 30 days.